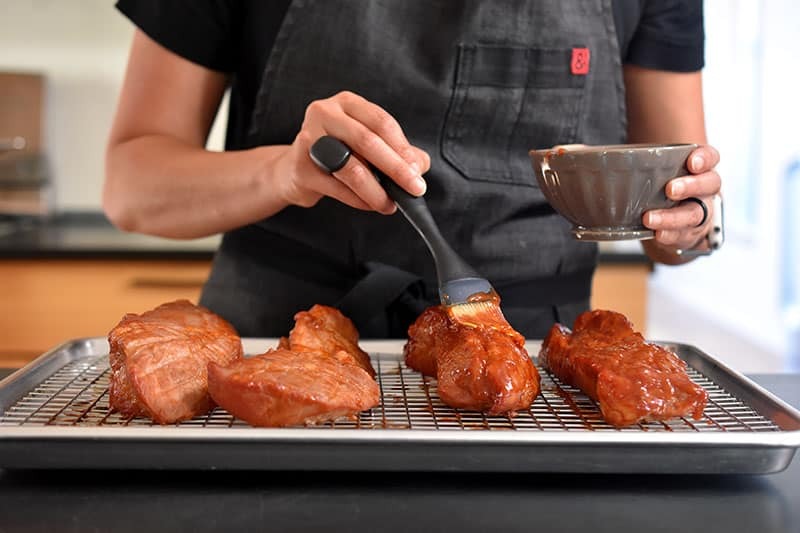 Here’s my authentic Whole30-friendly, Paleo Char Siu recipe: Cantonese roasted pork lacquered with a sticky-sweet marinade. When I first switched to eating Paleo in 2010, the foods I missed eating the most weren’t pizza, pasta, or cake. Even then (waaaay back in the ancient, pre-Instagram era) I knew I could run Internet searches for Paleo-fied substitutes for those dishes. The stuff I craved the most—but couldn’t find adequate replacements for—were the Cantonese dishes of my childhood. 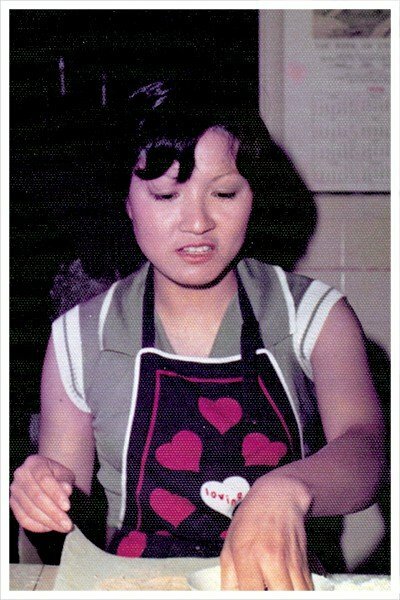 To be clear, these weren’t the barely-recognizable Westernized versions of Chinese recipes; I’m talking about the plates of steaming-hot, perfectly seasoned meats and vegetables that my mom created in our family kitchen in Menlo Park, California, night after night. Still, there were some family recipes that I’d long ago decided were impossible to make Paleo, let alone Whole30-friendly. Many of these dishes demanded non-compliant ingredients (like store-bought hoisin sauce, which contains gluten, sugar, and other non-Paleo ingredients) or required overly complicated steps. I’ll admit that my laziness kept me from attempting a few of these recipes, too. One of these dishes kept nagging at me: char siu, Cantonese roasted pork lacquered with a sticky-sweet marinade. You know what I’m talking about: the bright red hunks of meat that hang in the display windows of Chinatown BBQ joints. 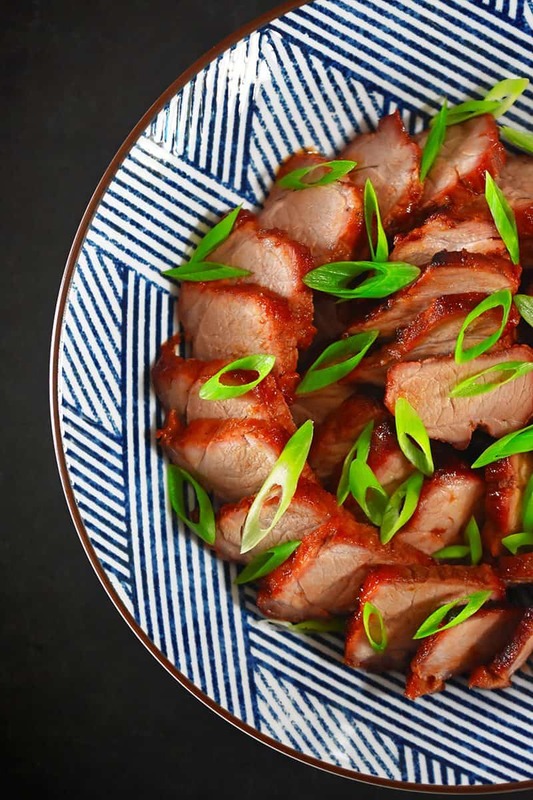 I missed char siu like crazy—especially my mother’s version. 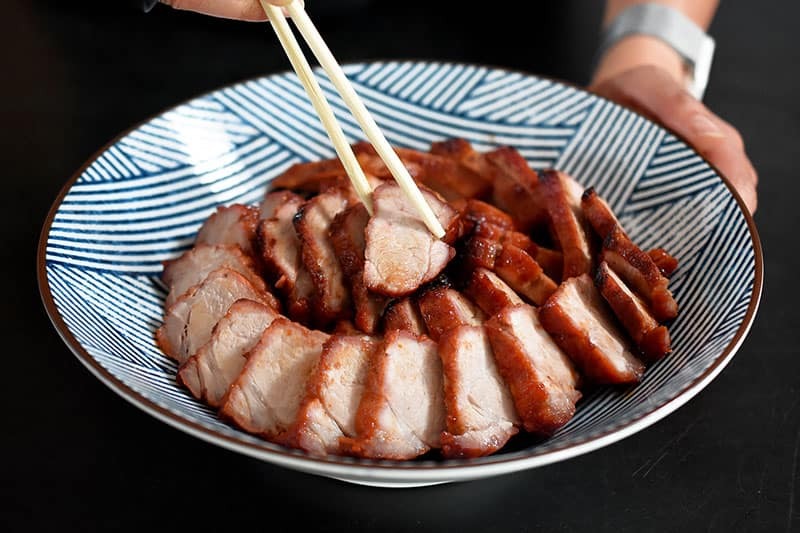 As a kid, I would linger at my mom’s elbow every time she sliced up her char siu, panting like a puppy desperate to catch a scrap of leftovers. I wasn’t subtle, and refused to budge until my mom slipped me a juicy piece of pork right from the cutting board. Fueled by these happy food memories and the reminder that persistence pays off, I made it my mission to come up with Paleo version of this porky delight. I’ll spare you the details of my many failed experiments (including the batch that looked amazing, but literally stunk like skunk), but I’m happy to report that after weeks of testing, I finally came up with a char siu recipe that garnered unanimous approval from my finicky kids, my visiting in-laws, and even the pickiest eater in the family: ME. 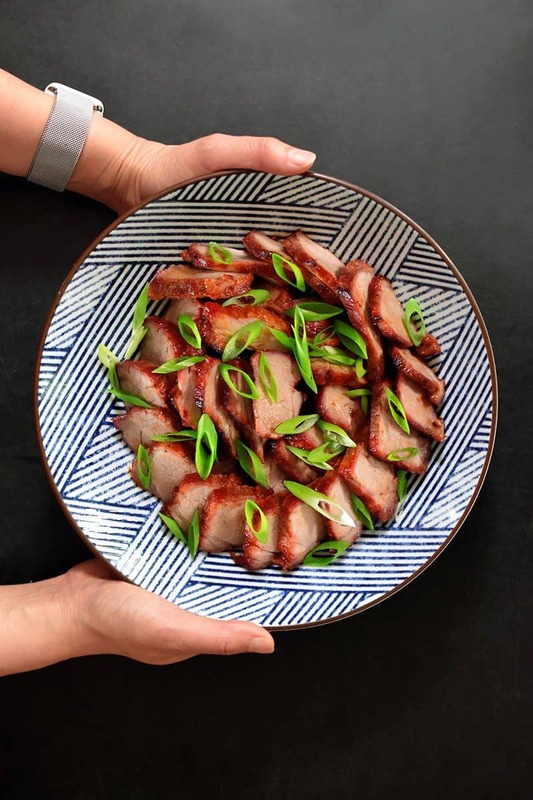 My Paleo version of char siu is even Whole30-friendly if you use fruit-sweetened jam and leave out the honey! Note: It’s important to use a high-quality, 100% fruit jam in this recipe. 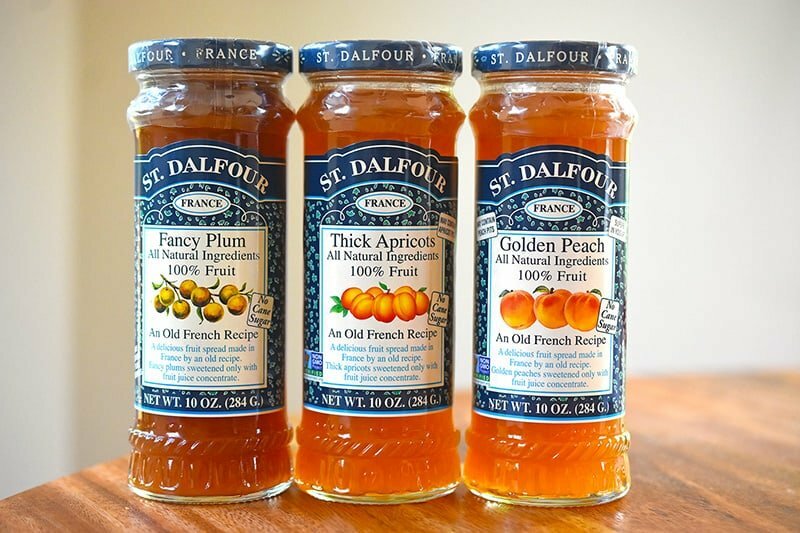 I buy St. Dalfour brand (it’s not a sponsor—I just like the stuff, and it’s pretty widely available), and its plum, apricot, and peach spreads work equally well in this recipe. No more jibber-jabber. 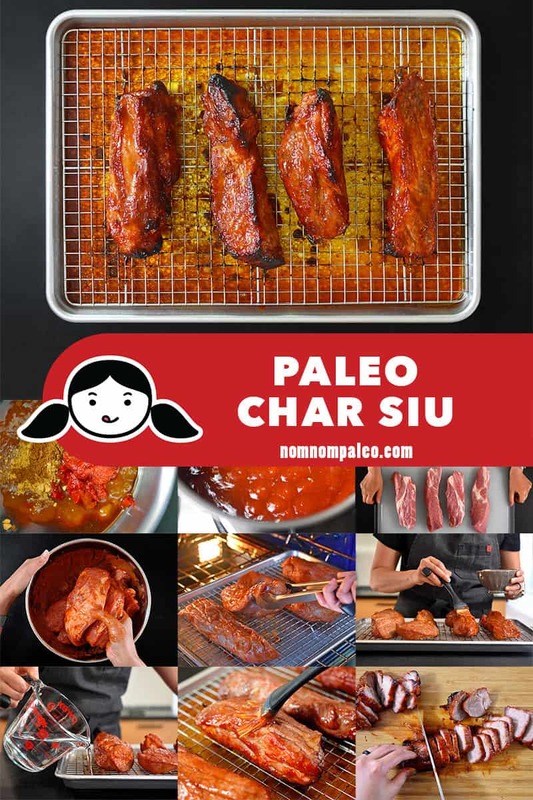 Let’s make some Paleo char siu! First, make the marinade and cool it to room temperature. Add the jam, coconut aminos, tomato paste, almond butter, honey (if you’re not doing a Whole30), fish sauce, Chinese five spice powder, and ground ginger to a small saucepan. Whisk the marinade as you heat it to a simmer over medium heat. Next, prepare the pork. 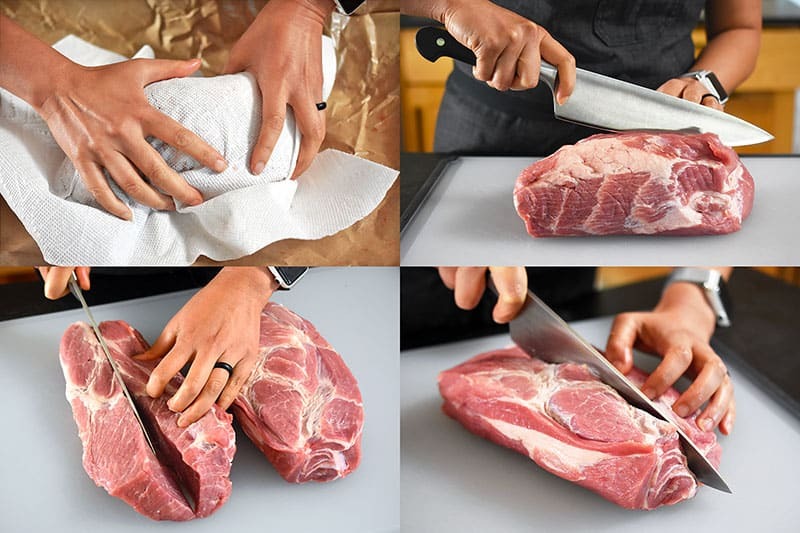 Blot the pork shoulder dry with a paper towel and slice the meat into 2-inch strips of even thickness. The pork strips should be roughly uniform in size. 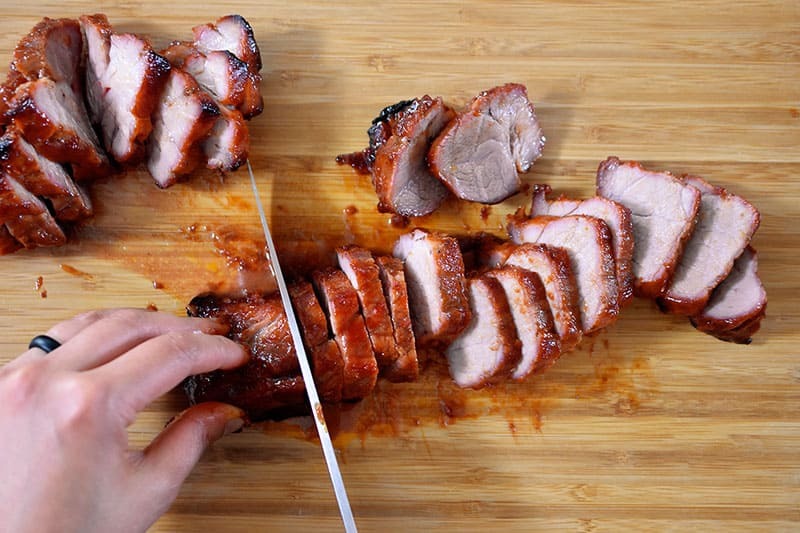 It’s fine to have fatty pieces of pork because: (1) it’s tasty, and (2) you don’t want want to end up with dry char siu. …and pour all except ⅓ cup of the cooled marinade onto the pork. Cover the reserved marinade and store it in the fridge. Use your hands (a.k.a. 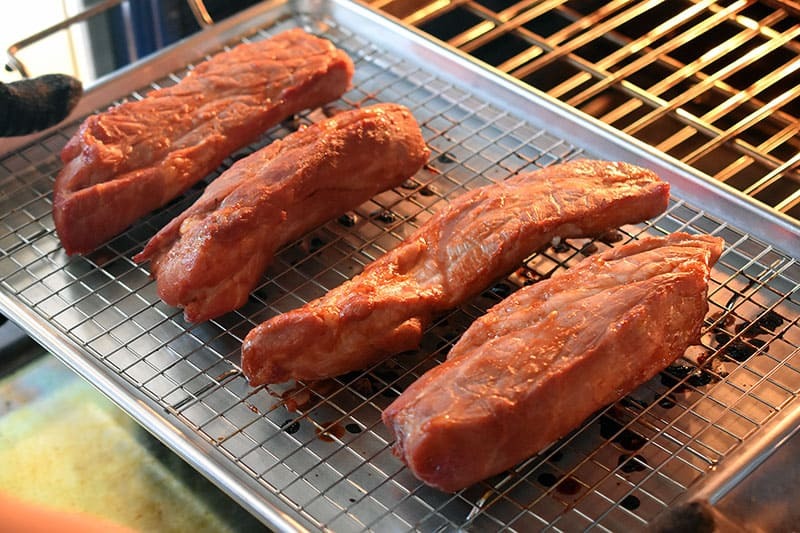 nature’s tongs) to coat the marinade all over the pork strips. Cover the bowl with a silicone lid or plastic wrap and store in the fridge for 2 to 24 hours. When you’re ready to roast the pork, preheat the oven to 350°F with the rack in the middle position. 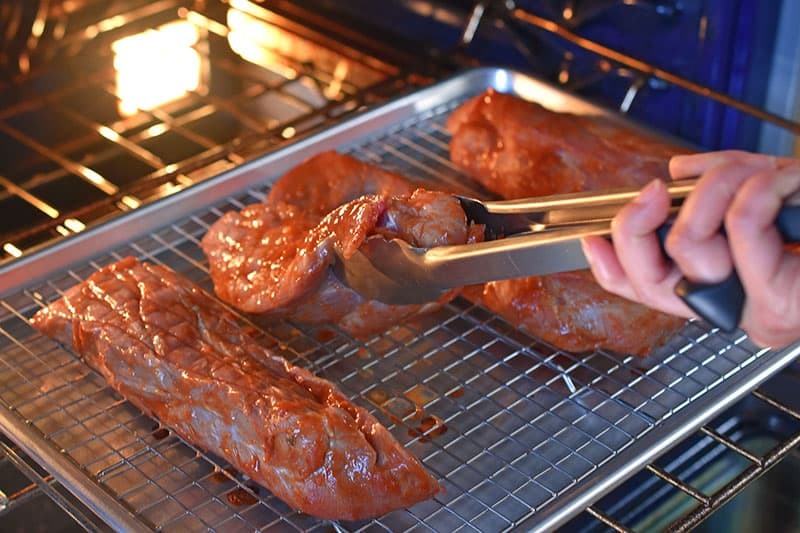 Place the pork on an oven-safe wire rack in a rimmed baking sheet. Roast for 30 minutes, flipping the pork pieces at the halfway point. Remove the pork from the oven and increase the oven temperature to 400°F. Brush half of the reserved marinade on the top of the pork pieces. Pour enough water into the bottom of the pan so that you have a thin layer coating the bottom. This will keep the drippings from burning while the pork cooks. Roast for 25 minutes, and then flip the pork pieces over and brush on the remaining marinade. Roast for another 20 to 30 minutes or until the pork is slightly charred on the edges. 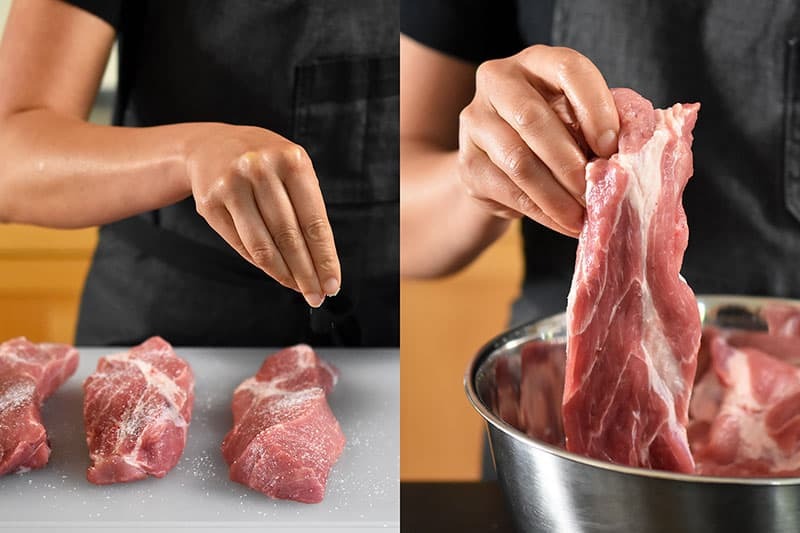 Rest the pork for 10 minutes, and then slice against the grain into chompable pieces! …garnish with sliced scallions, and serve! Leftovers can be kept in the fridge for up to 4 days or frozen for 4 months. 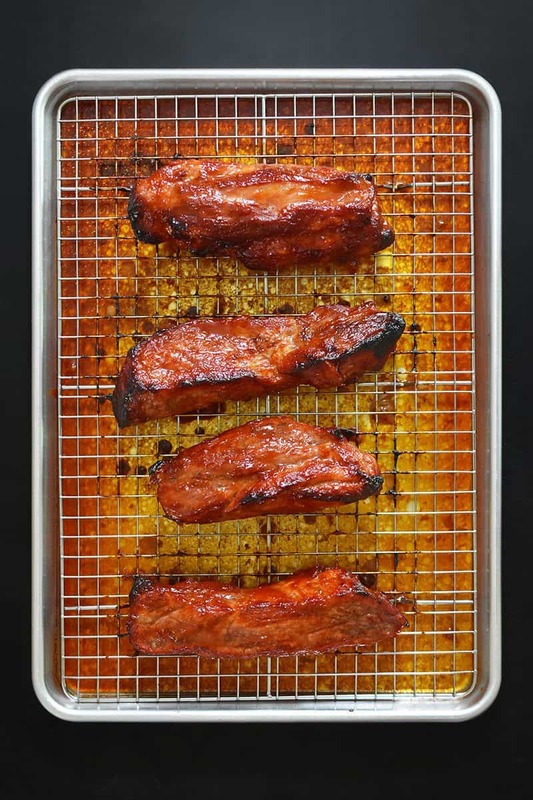 And if you keep your eyes glued to my blog, I might just show you a tasty way to re-purpose your leftover char siu in the very near future! Use the leftovers to make my Asian Cauliflower Fried Rice or Paleo Hiyashi Chuka (Cold Ramen Salad)! Wanna watch me make this dish on my Facebook Live broadcast (recorded on July 19, 2017)? 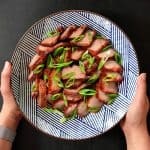 Here's my authentic Whole30-friendly, Paleo Char Siu recipe: Cantonese roasted pork lacquered with a sticky-sweet marinade. 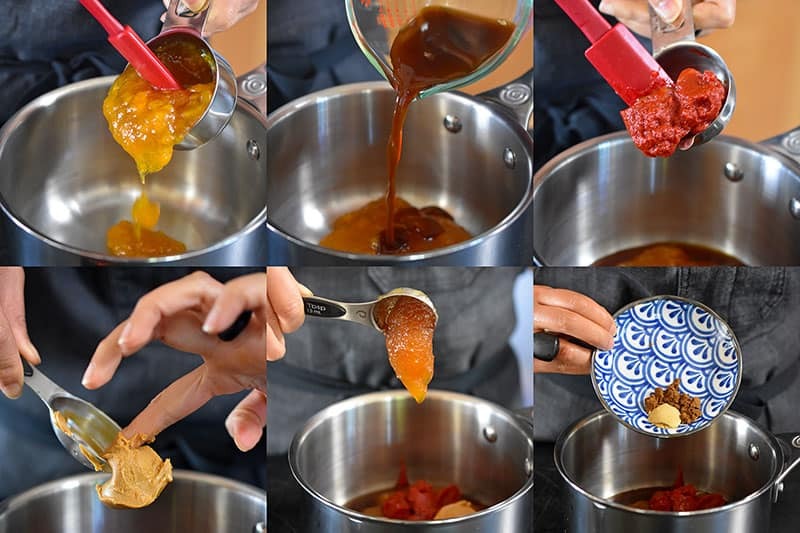 Make the marinade and cool it to room temperature: add the jam, coconut aminos, tomato paste, almond butter, honey (if you’re not doing a Whole30), fish sauce, Chinese five spice powder, and ground ginger to a small saucepan. 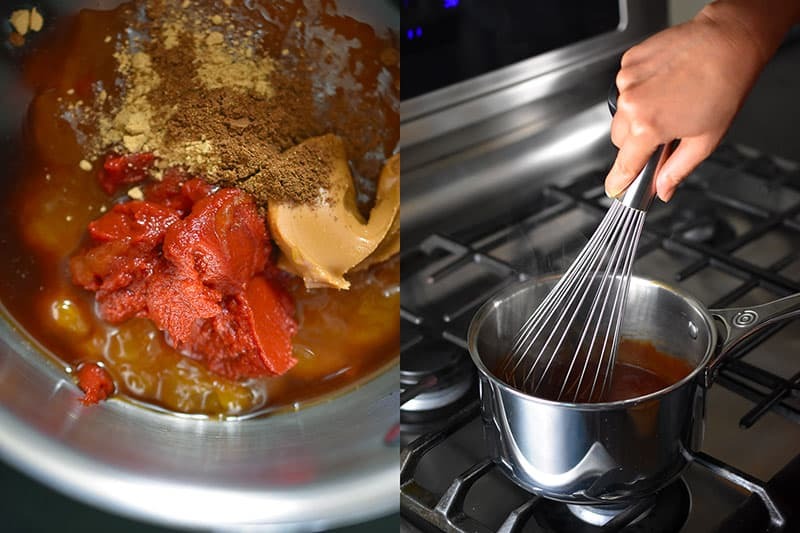 Whisk the marinade as you heat it to a simmer over medium heat. Sprinkle the kosher salt all over the pork pieces. 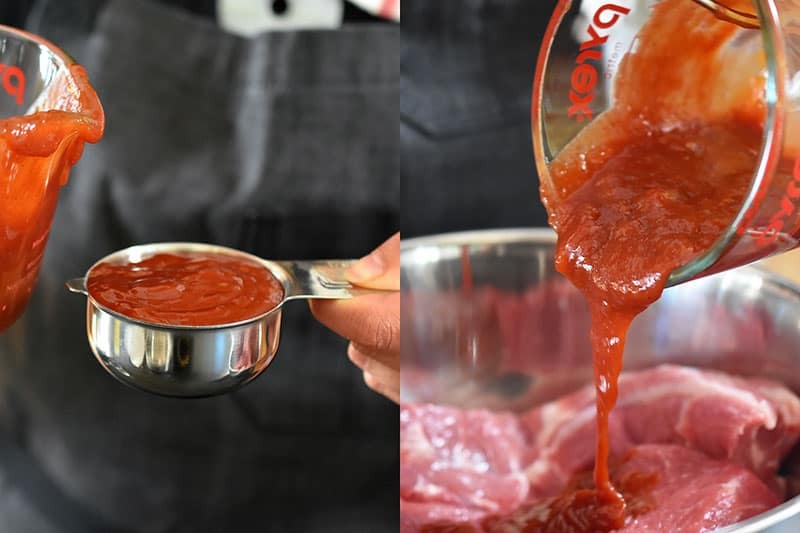 Place the pork in a large bowl or zippered storage bag and pour all except ⅓ cup of the cooled marinade onto the pork. Cover the reserved marinade and store in the fridge. 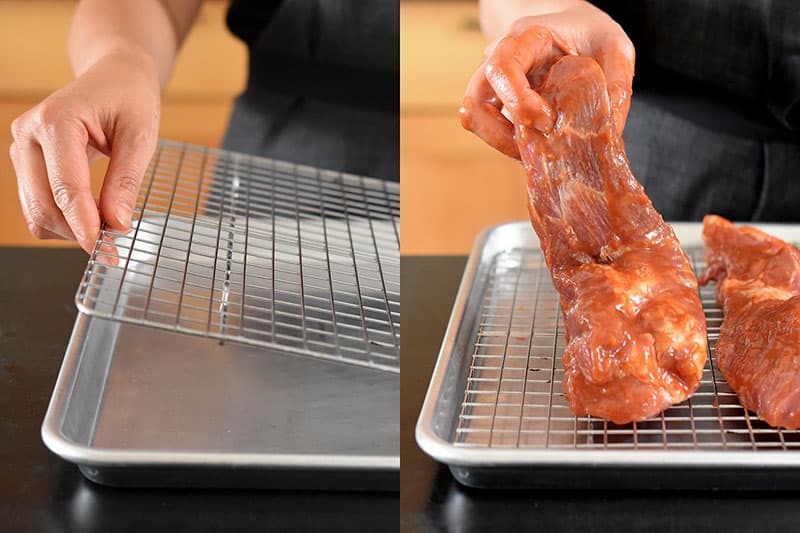 Use your hands to coat the marinade all over the pork strips. 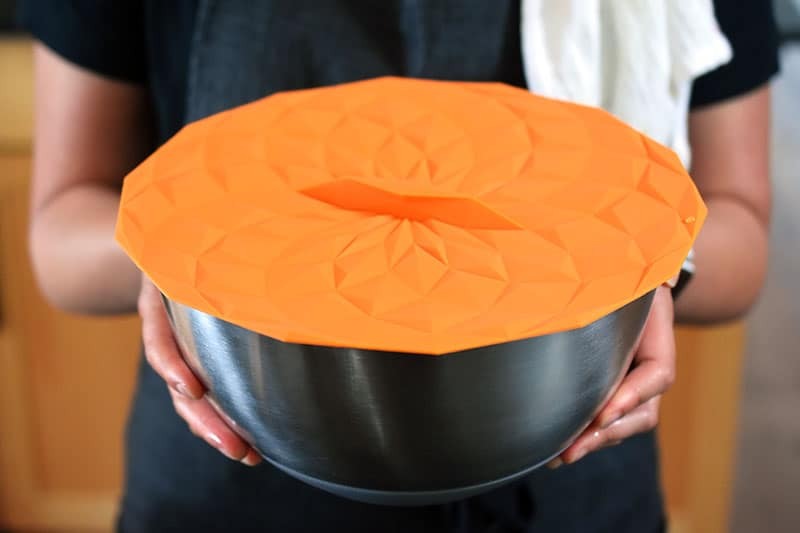 Cover the bowl with a silicone lid or plastic wrap and store in the fridge for 2 to 24 hours. 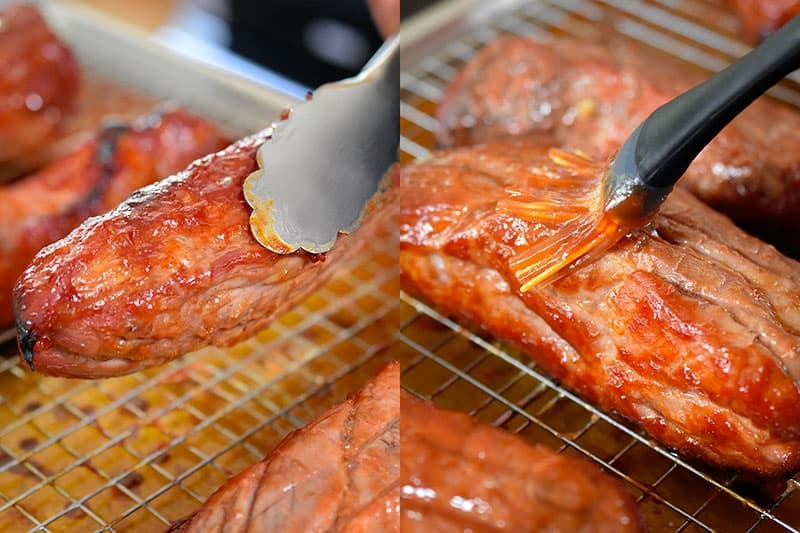 Roast the pork for 30 minutes, flipping the pork pieces at the halfway point (15 minutes). Brush half of the reserved marinade on the top of the pork pieces. 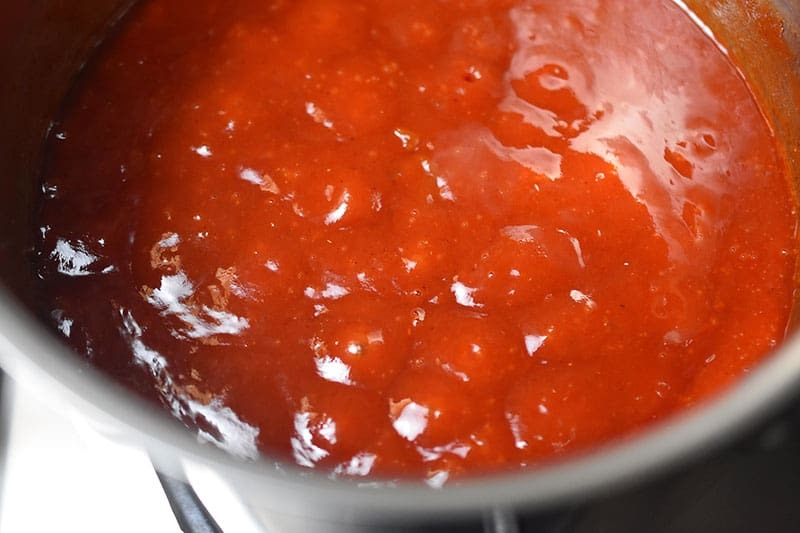 Pour enough water into the bottom of the pan so that you have a thin layer coating the bottom. 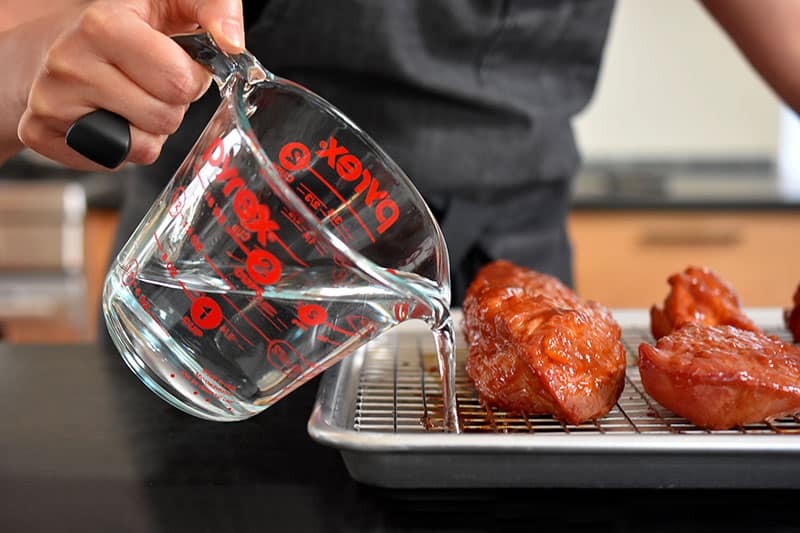 The water will keep the drippings from burning while the pork cooks. Roast the pork for 25 minutes, and then flip the pieces over and brush on the remaining marinade. Roast for an additional 20 to 30 minutes or until the pork is slightly charred on the edges. Rest the pork for 10 minutes, and then slice against the grain into chompable slices. 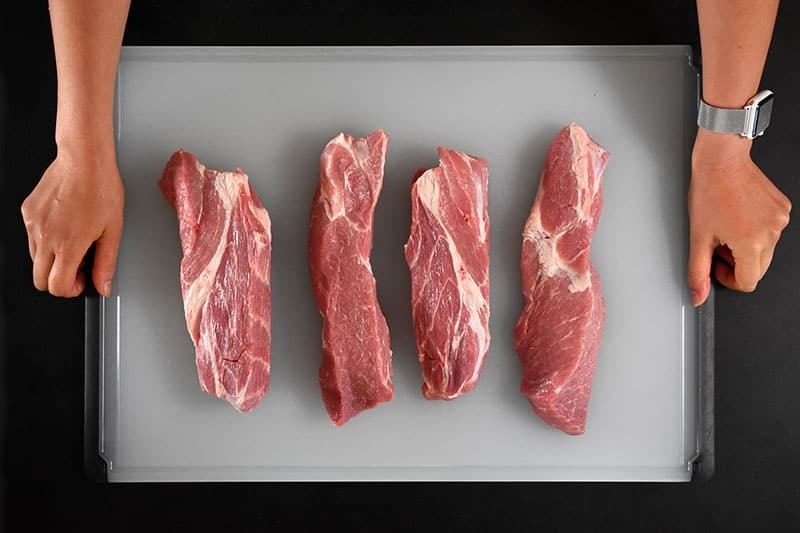 Arrange the pork on a serving dish and garnish with sliced scallions, and serve! Leftovers can be kept in the fridge for up to 4 days or frozen for 4 months.